Visitation will be held from 4:00-7:00 PM on Thursday, February 14, 2019 at Conway-Markham Funeral Home in New Hampton and will continue at the church one hour prior to the funeral services on Friday. Online condolences may be left at www.conway-markhamfh.com. At the family’s request memorials may be directed to the Michael J. Fox Foundation for Parkinson’s Research or Trinity Lutheran Church. Dennis David was born August 20, 1943 to Charley and Marian (Ohden) Reaman in Carroll, Iowa. He attended Sac Community School and graduated in the class of 1961. He went on to attend Ellsworth College in Iowa Falls. On March 6, 1966, Dennis enlisted in the United States Navy, serving two and a half tours in the Vietnam War before returning home. He received his honorable discharge on December 31, 1969. Dennis was united in marriage to Jan Mandernach at St. Paul’s Lutheran Church in Sac City. The couple made their home in New Hampton where they raised their three children, Darren, LeAnn and Lanette. Dennis completed his education at the UNI where he received his Finance Degree. 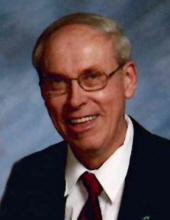 He went on to work as an auditor for the state of Iowa for 27 years, retiring in December of 2005. It was in 1978 when Dennis attended his very first Indianapolis 500 and the foundation was formed for the family’s love for the sport. He attended the race every year until 2011 with the exception for 1981 when his twin daughters were born. His final visit to the Speedway was in 2013 as he fulfilled his dream on the track riding in the Indy car two-seater completing three laps around 180 miles per hour. Dennis was an active member of Trinity Lutheran Church, Lions Club, New Hampton and Sac City American Legions, Shriners and Royal Order of Jesters. He enjoyed family vacations, local car races, and attending local sporting events. He always had a quick one liner or joke to share. His wife and family were the loves of his life. Dennis was a man who loved life and lived each day to the fullest. Those left to cherish his memory are his wife, Jan Reaman of New Hampton; his children, Darren Reaman of Speedway, IN, LeAnn (Tony) Ede of Manchester, IA, Lanette (Timm) Pint of New Hampton; his five grandchildren, Carver, Ainslea, Liam, Burke and Emersyn; one brother, Lawrence Reaman of Kansas City, KS; special great aunt, Myra McQuiston of Detroit, MI and nieces and nephews. He was preceded in death by his parents, Charley and Marian and his in-laws, Lela and Robert Mandernach and Maxine Mandermach. To send flowers or a remembrance gift to the family of Dennis D. Reaman, please visit our Tribute Store. "Email Address" would like to share the life celebration of Dennis D. Reaman. Click on the "link" to go to share a favorite memory or leave a condolence message for the family.